Have you heard about Bounce? 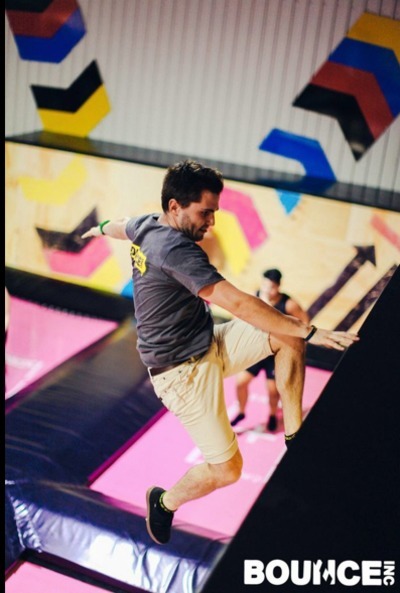 Their website describes themselves as a "massive indoor adrenaline rush for all ages." From what I've seen, that's pretty fair. The Blackburn North Bounce is a series of more than 50 interconnected trampolines. There are giant airbags, as well as wall running, dodge ball and slam-dunk courts. Can I just say it's way easier to get it all net when you can jump 4 feet in the air! Each session at Bounce Inc. Blackburn North goes for 50 minutes; you want to make sure you arrive at least 15 minutes before your booked time. You can book at the centre, but sessions do sell out especially during peak times like school holidays and weekends. To save your self (and your friends and family) from disappointment we recommend you book online here. 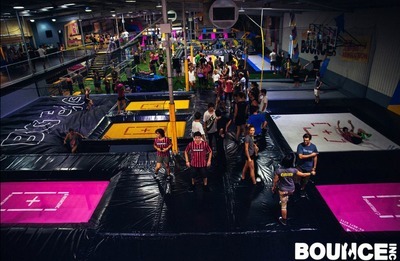 There's also a Bounce Inc. to be found in Glen Iris, Essendon Fields and Southland coming soon. There is a tuck shop on site for food and drink, and self-catering is not allowed. Water bottles are of course actively encouraged, although not on the mats. Given sessions are short it’s easy enough to wait for food until you’re on your way home if you want, but do remember to have a few snacks in the car if you aren’t going to purchase anything, because like swimming, bouncing will make you hungry. All Bouncers must be over 3 years old, and if they are under 110cm they have to take part in the special Junior Jumper sessions for their own safety. These are on Monday to Friday, from 10am – 4pm, and on weekends until 12pm during the school term. Bounce also runs classes like MiniBounce, for 3-5 year olds, and BounceFit, for adults. They also have off peak and student discounts, as well as cool tournaments. To see complete pricing check out their booking page here. As a rough guide it varies between $8 and $16 per session depending on age, etc. If you’re interested in their special events, keep in touch by liking them on Facebook here. Now, onto the freebie! I have to admit, this time I wish that I were entering the giveaway, not writing about it. Bounce Inc Blackburn North have kindly provided 2 sets of passes. Each set contains a pass for a MiniBounce class (for details on what this involves go here) and a Bounce Fit session (details here). The idea is that while a child is happy at Bounce Fit, Mum, Dad or even older sibling is having an unusually fun workout a few mats over. MiniBounce and BounceFit classes are run on Monday, Wednesday and Friday at 10am and 11am. Bounce socks are included in the cover price so the winners won't need to worry about them. All you will need to bring is the attendees and waterbottles! Parking is easy with a basement car park. There is a lift to get to the main entry for those of you with prams. There's also disabled parking in the laneway (please use the side door). Or if public transport is more your thing you can get there by bus 279 or 906 (expect a 5 minute walk from the bus stop) or train. The closest train station is Laburnum on the Belgrave and Lilydale line. The walk from the station is much longer- 30 minutes, so not the best method for those with very little ones. Where did your kids learn to swim? Are your kids safe on the street? What is the best ipad app for kids? What's Your Favourite Place to Take the Kids in Melbourne? How do you keep possums out of your garden? How realistic are romance novels? Bounce Inc is great, kids absolutely love it!